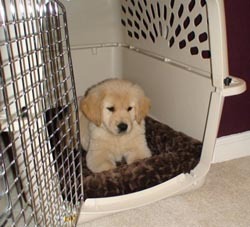 Dog Crate Training is an essential part of training your pet. Introducing your furry friend to the dog crate properly is essential to your success. It is something that should never be forced. Patience is key. Taking your time will produce the best benefits. Go at your dog’s pace. If you do not, you can get off to a bad start, and if your canine doesn’t ever want to go inside, it can be hard to correct. One of the best things to do is to make it comfortable for your pet from the start. Start by keeping it in the location where you plan on keeping it all of the time. Ideally, this should be an area where your canine feels like he or she is a part of the family. Personally, I like putting them in the bedroom, family room, or living room. It is strongly suggested to put your pet’s favorite toys, blanket, or bed inside the crate too. After setting it up, go about life as you normally would, paying little attention to the new addition to your home. If you do this, your dog is more prone to explore and go inside the crate on his or her own, without you having to do much at all..
Having your dog check the crate out on his or her own is a wonderful way to make it comfortable. Never force your canine inside under any circumstances. It will only lead to frustration and difficulty. It is key that your pet explore it and be curious about it on his or her own. Putting a treat inside definitely makes my dogs curious. The best bet is to be patient. See how your pet behaves around it for a few days or longer. If your pet gets used to it being there, curiosity will eventually take over, and he or she will start exploring around it and eventually go inside. If your pet is not interested at all, grab another treat and see if you can lure him or her inside. Again, never force your dog inside. It will only make it a negative place to be. Early on, always leave the crate open. Don’t lock your canine inside. It will give it a comfortable feeling for your pet. Let your pet decide when to go in or out of the crate at first. This will get things started off in the right direction. Many people find that they rarely have to lock it if they start out this way. Their pets just come and go as they please. Many people, like myself, have to go to work and leave for part of the day. If your canine chews, is a puppy, or needs some additional training, then you will want to lock him in during these periods away. Take your time before locking your pet inside. Taking a few weeks to make it comfortable is a key aspect to being successful. It’s important to note, that you should never use the crate for punishment. Don’t send your canine to the crate for doing something you don’t like. Dogs don’t comprehend that type of punishment. They will only associate the crate with a negative place. If this happens, getting them to enter becomes much more difficult. Do it right the first time and save yourself the headache of correcting improperly learned behaviors.